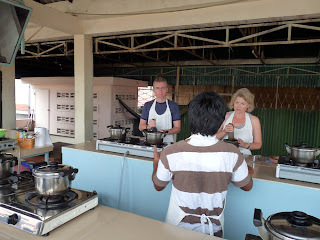 So with that in mind, I signed up for the Cambodian Cooking Class in Phnom Penh. 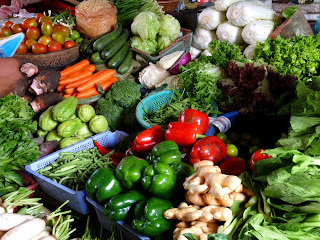 This one-day course is designed to give tourists some insights into the ancient and unique Khmer cuisine. 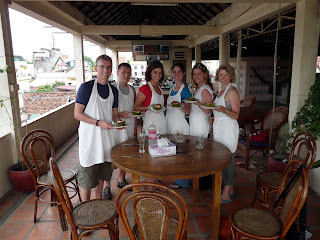 For $20 per person, it was also a very inexpensive way of eating for the entire day. 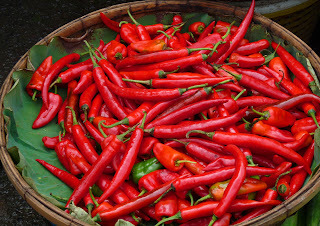 The first stop was the local market where our instructor pointed out the various ingredients that we would be using for our courses. 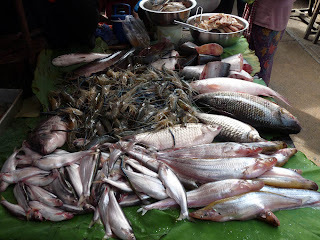 Everything was very fresh and we were able to sample a couple of things here and there. 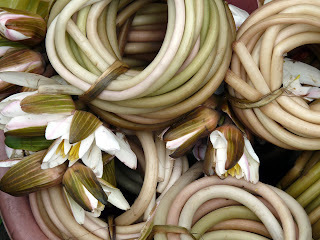 But a Cambodian market is not exactly the place to stimulate an appetite. The smell was overpowering and seeing slabs of animal body parts (or animals waiting to be body parts) wasn't exactly a turn-on. In more industrialized countries, we are so worried about sanitation and hygiene but it was a different story in Cambodia. 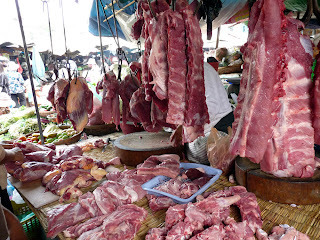 They didn't have refrigeration in the market so the meat hung out in the hot weather all day. I made a mental note to make sure all my food was WELL cooked. 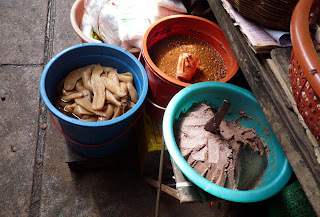 Cambodians like to eat some weird things. 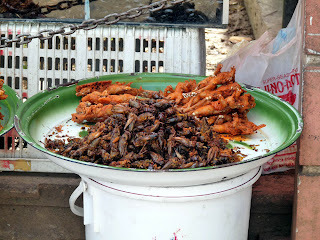 At Romdeng restaurant in Phnom Penh, you can order deep fried tarantula. Fortunately, I can't tell you how it tastes. Here are some water lilies which are supposedly pretty good. And salted duck eggs. 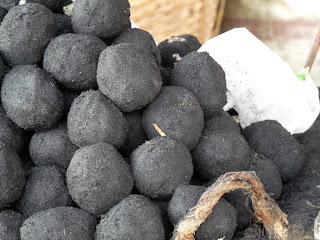 These eggs are covered in a thick salty charcoal. Don't ask me how they tasted. I didn't have the chance to try these either. 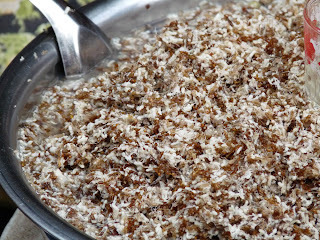 One of the most distinctive ingredients in Khmer cuisine is the fermented fish paste or Prahok. It is the grey pasty looking stuff below. Sounds pretty bad and smells worse but Khmer food still tastes damn good with it mixed in. Even red ants were available for eating. I wanted to try some as an act of revenge for all the times that ants have tried to eat me. Or how about some other crunchy insects? We returned to the restaurant where we began to make our own food. 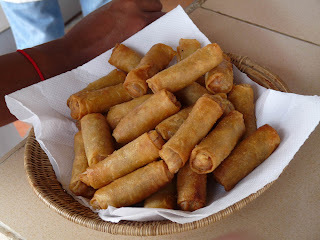 Our first challenge was to make spring rolls. They aren't hard to make but the instructor thought I was doing a lousy job of rolling them up. He didn't hesitate to correct me as if I were actually going to make these things in the future. Doesn't he know that I can buy them at Trader Joes for a very reasonable price? 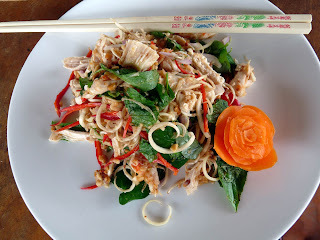 Then we moved on to the Banana Flower Salad. This required a lot of effort. I think it took us over an hour to make. Once again, I was yelled at because I was slicing the banana flower too thickly. I even made the carrot flower in the picture. You like? Then it was time to learn how to make Amok. 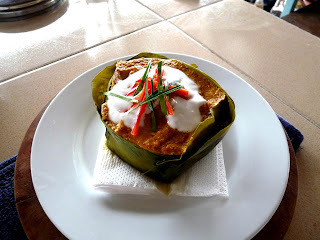 Amok is a unique Khmer fish curry which is steamed in banana leaves. I think this took 12 hours to make. Actually, I can't remember exactly how long it took but it seemed like a freakin' long time. Everything was done from scratch. We made the curry, the sauces and even the banana leaf bowl. Ta-dah! This was my own creation. I was so proud, it was almost as if I had given birth to it. I don't think I have ever made anything that looked and tasted as good as this. This is our graduation picture. Everyone passed. Nobody died of food poisoning. (Not that I know of). We were all very happy. 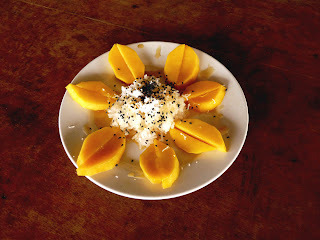 As a final course, we made some sticky rice with mangoes and syrup. This course is highly recommended if you happen to be in that corner of the world. 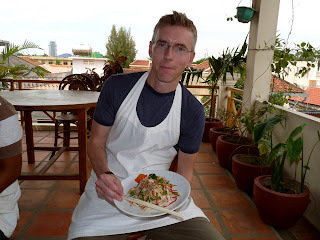 It is offered by the Frizz restaurant, which is where I had my best meal in Phnom Penh. You can check out the website below. You meet great people, have a lot of fun and get to eat some amazing food all for $20. What is not to like? Airfare to Phnom Penh not included.